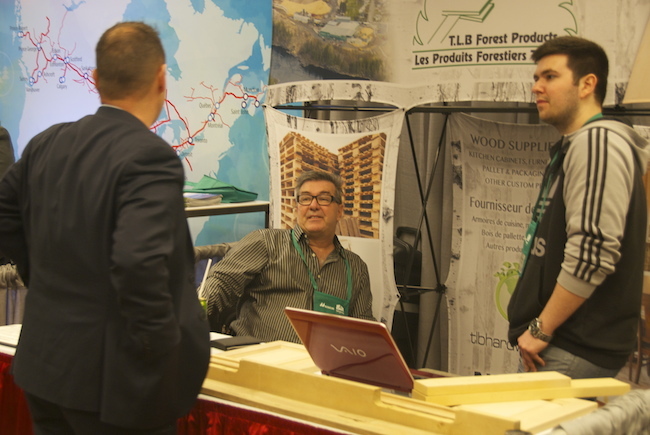 March 30, 2017 - Downtown Montreal was a hub of activity for Canada’s forest products sector this week as international and North American buyers met with suppliers and producers large and small. 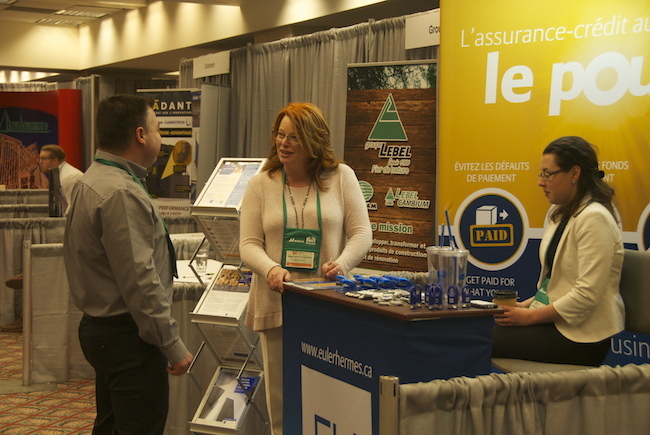 Nine hundred registered exhibitors and attendees of the fifth annual Montreal Wood Convention filled the Bonaventure Hotel March 28 to 30 for meetings, sessions and a well-attended trade show. 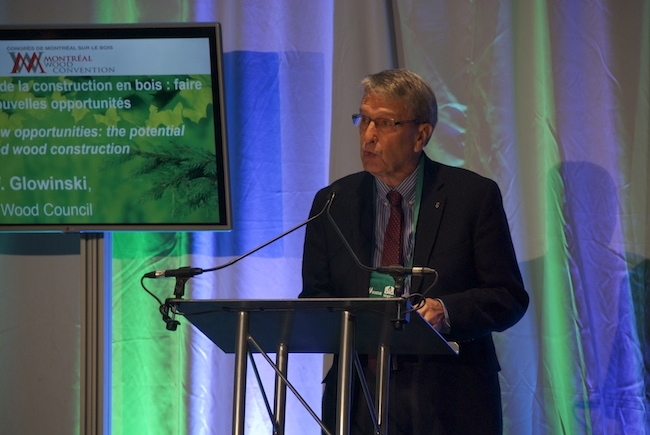 The event is put on via a partnership between the Quebec Wood Export Bureau, the Québec Forest Industry Council, the Maritime Lumber Bureau and the Ontario Forest Industries Association. 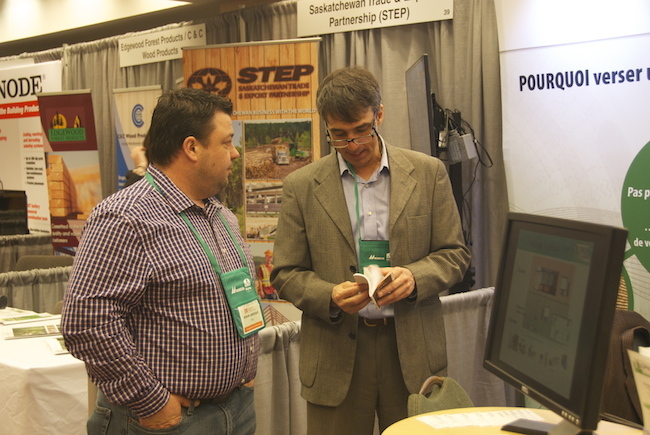 Sven Gustavsson with the Quebec Wood Export Bureau, a primary organizer, said the convention is unique in that its primary goal is to introduce global buyers to Canadian producers. “We exceeded our forecast. 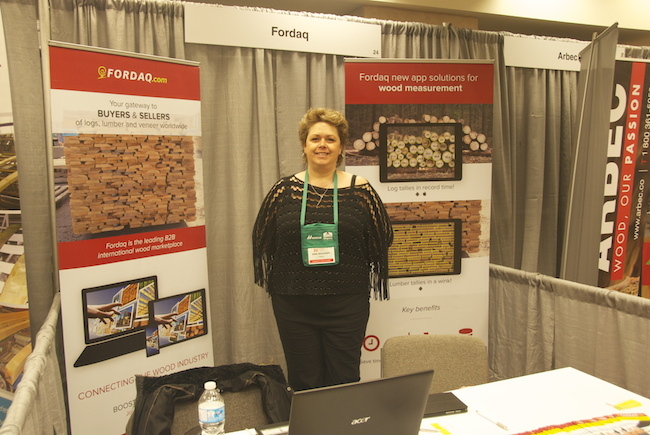 We had more people from overseas and many of them were serious buyers looking for Canadian wood products,” Gustavsson said. Between 60 and 80 buyers were present from more than 10 overseas countries including China, Poland, and Pakistan, as well as 150 from the U.S. About 16 countries were represented total, including exhibitors. Day 1 of the convention began with industry visits for overseas buyers followed by an industry seminar on wood and the future of furniture and flooring. The second day welcomed three guest speakers to talk about economy, markets and marketing. 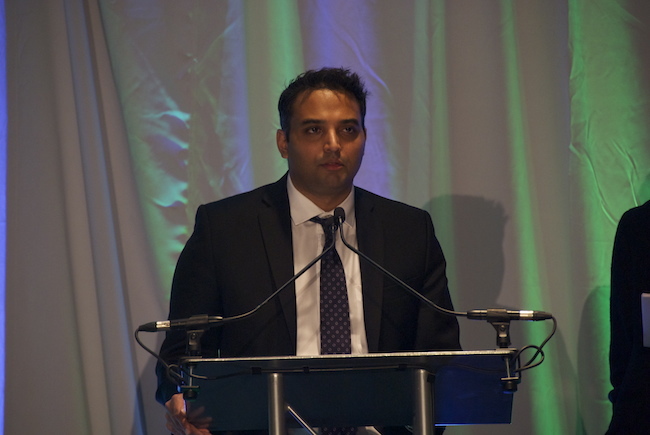 First up was CIBC Capital Market’s Hamir Patel who shared data on housing starts in the U.S. and Canada. While growth has slowed, mainly due to low homeownership rates for the millennial generation, Patel forecasts an uptick over the next four years thanks to a trend to build lower-cost housing and boomerang buyers. Boomerang buyers are those who lost their homes in the housing bust around 2008 and are just now beginning to re-qualify for mortgages. Touching briefly on the softwood lumber agreement, Patel says if the negotiations are similar to the previous round in 2001 to 2006, the countervailing duty and anti-dumping duty will likely land at higher levels and then gradually lower over time as Canada appeals. 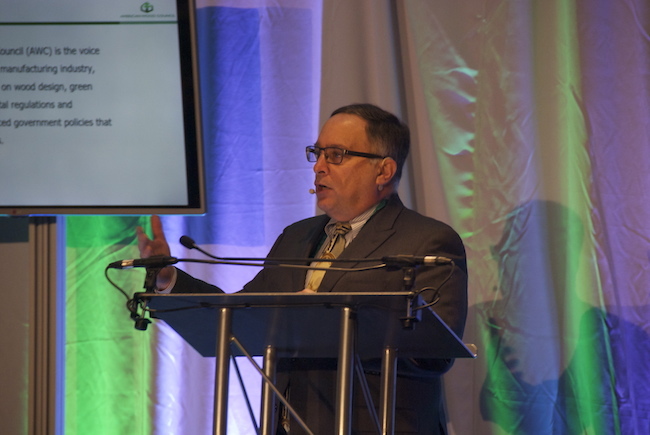 Robert Glowinski, president and CEO of the American Wood Council, was up next with a presentation on the U.S. efforts to gets tall-wood buildings recognized in the national building code. The Tall Wood Project is a five-year plan to work towards 12×21 – 12 storeys by the 2021 building code. The first step of the plan was to create the Tall Wood Ad-Hoc Committee within the International Code Council (ICC). During an ICC meeting with that committee that the goal evolved to 20×21 – 20 storeys by 2021. Glowinski described the testing process to submit a code change, which includes fire, seismic and blast tests. The AWC works closely with the Canadian Wood Council and the National Research Council of Canada, however, all testing must be done in U.S. labs for it to qualify. That means any existing international research must be redone, Glowinski explained. At this stage in the process, the main hurdle for the ad-hoc committee is changing preconceived opinions of voting members of the fire service who are naturally sceptical, Glowinski said. 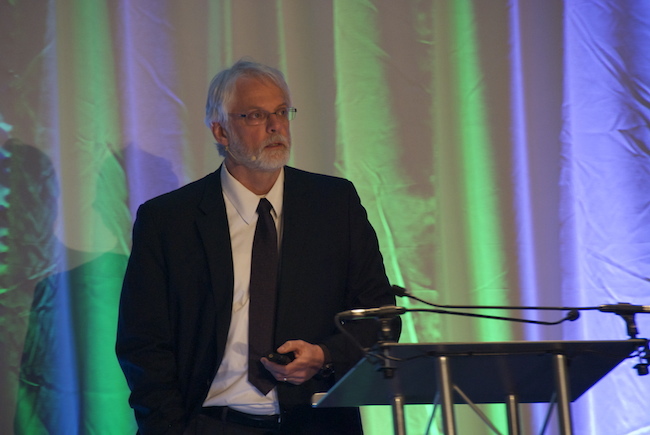 Following Glowinski’s presentation was a talk on the forest sector’s role in climate change mitigation from Canadian Forest Service’s senior researcher Werner Kurz. The sector’s role is increasing, Kurz told the crowd, but stressed the importance of carbon retention. The longer the wood is intact, the longer it stores carbon and the better it works to lower Canada’s overall greenhouse gas emissions. Structural building products made from wood, therefore, have the highest mitigation benefits. And to that end, tall wood buildings are an important part of the strategy, Kurz said. Day 2 continued with a luncheon and guest speaker Manjit Minhas, co-owner and co-founder of Minhas Breweries. Minhas shared her inspiration story of how she became a hugely success entrepreneur. 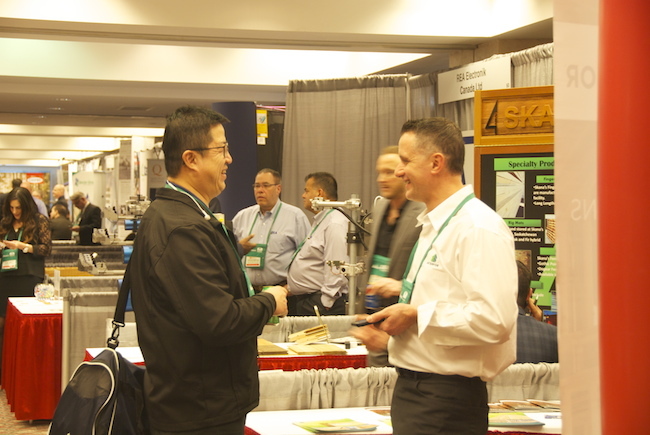 The tradeshow opened following the luncheon, during which buyers mingled with suppliers and producers as well as equipment manufacturers. The third and final day of the convention began with a technical session on trading tools including risk management, sales performance and B2B e-commerce, and wrapped up with the trade show.